See this popup local area map showing Conway Summit south to June Lake (look for waypoint CEM395). 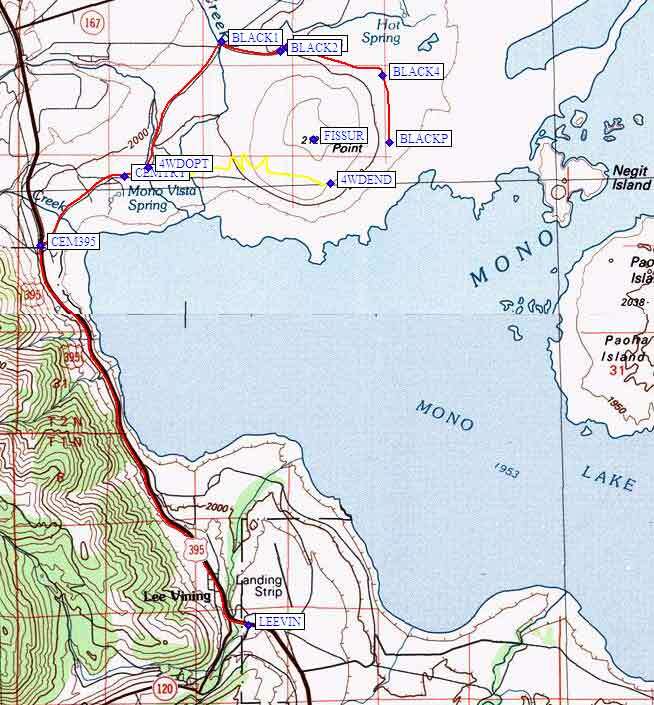 View the waypoint file (above) for GPS Routes BLACK POINT CARS, BLACK POINT 4WD, and HWY 395 CONWAY TO JUNE LAKE. NOTE: Jon Kazmierski, a recreation manager for the Forest Service in the Mono Basin, wants everyone to know that trash and trampling of vegetation are problems, that this area is a sacred site to the local Paiute Tribes, and that using the rough 4WD road makes it wider and 'increases impacts'. Please be sensitive! From the junction of Highway 395 and Highway 120 near Lee Vining (waypoint LEEVIN), go north 4.3 miles. Turn at the clearly marked right hand turnoff for well-paved Cemetery Road (waypoint CEM395), shown in red on the map below. Pass the old boneyard in about a half mile (waypoint CEMTRY), and then the road becomes unpaved but graded. Go straight at the first junction with a private road to the right (waypoint 4WDOPT, see note below about possible shortcut). After driving 3.7 miles from Hwy 395 on Cemetery Road, take a poorly marked right turn onto an unnamed dirt road to Black Point (waypoint BLACK1). After driving 2.6 miles on the unnamed road, going by a couple of small junctions (waypoints BLACK2-BLACK4), the road dead-ends at a parking lot with some interpretive signs (waypoint BLACKP). There is no trail, but the cross-country route finding is trivial. 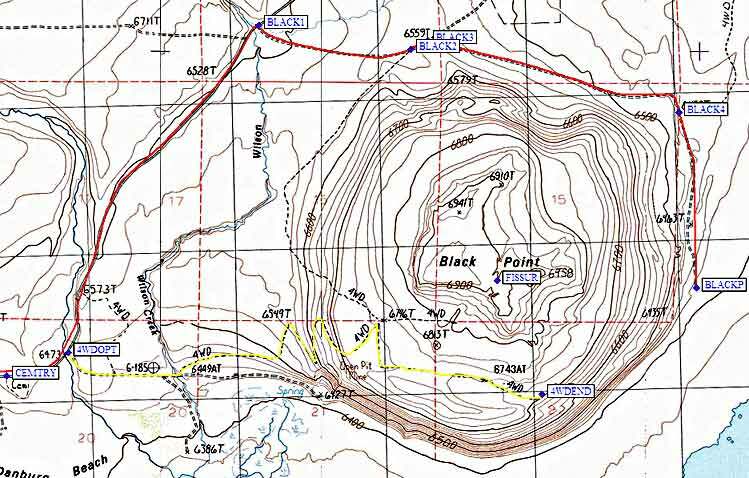 Hike uphill across the cinders to the sumit at Point 6958, about 1/2 mile from the road. The fissures are visible from the top. Continue in a westerly direction for a couple hundred yards, drop into the big cracks in the earth (FISSUR), and then give yourself an hour to experience the interior. NOTE: It MIGHT be possible to shortcut to the fissures by leaving the main dirt road on a 4WD road at waypoint 4WDOPT and following the yellow line. We didn't go this way, but we did see a truck parked near where the map shows the 4WD road ending (waypoint 4WDEND).